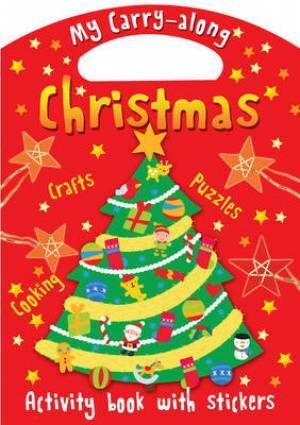 This festive book features a mixture of make-and-do crafts and on-the-page games, with a page of colourful bound-in stickers to help complete the activities. Designed to be used during advent, the front flap features a cut-out Christmas tree which can be decorated with 25 stickers in the countdown to Christmas day. A die-cut carry-along handle means that young craft-workers can take their activities with them wherever they go - and with simple, brightly illustrated activities to appeal to younger children and photo-illustrated step-by-step crafts to give older children something to get their teeth into, this is a perfect solution for grown-ups looking for activities for families and groups of excitable children. My Carry-along Christmas by Jocelyn Miller was published by Lion Hudson in September 2011 and is our 19432nd best seller. The ISBN for My Carry-along Christmas is 9780745962597. This carries the warning ‘Not suitable for children under 36 months’ after that plenty of fun to be had quite safely but little ones will need adult help. Things to play with, things to make and things to puzzle out and of course stickers to help along the way. Ingenious ideas, with colourful presentation. Got a question? No problem! Just click here to ask us about My Carry-along Christmas.